So the Autumn weather had arrived together with the end of daylight savings, which made for some chilly sunsets and early days. 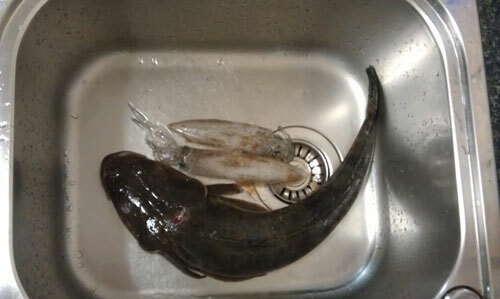 But the cold weather also bring in some big squid as well. Knowing this, we concentrated our efforts on some squid jigging. 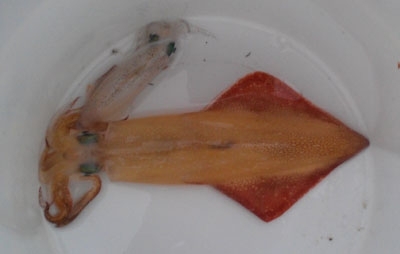 I would normally go the smallest size I can get to target the bait sized squid as well, but I switched to a slightly larger model, a 2.5 in hope of some southern calamari. So after a good hour of fruitless jigging, I felt a familiar pull on my line. It at first feels like you’ve hoooked on to some seaweed as it feels like a dead weight, up until they hit the hooks and try to pull away. I called it a southern as the pull is more intense. After a few hours of jigging we managed a two large specimens at around the 30cm mark. 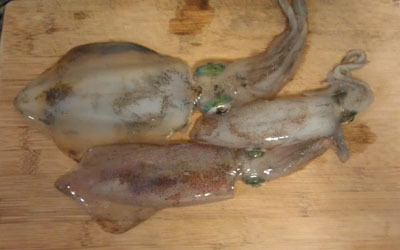 You may be wondering how to tell the difference between a Southern Calamari Squid and an Arrow Squid. The calamari’s wings go all the way up to the head, whereas the arrow squid’s wings join the body only a part way up, making it look like an arrow, hence the name. The calamari also have beautiful big green eyes. 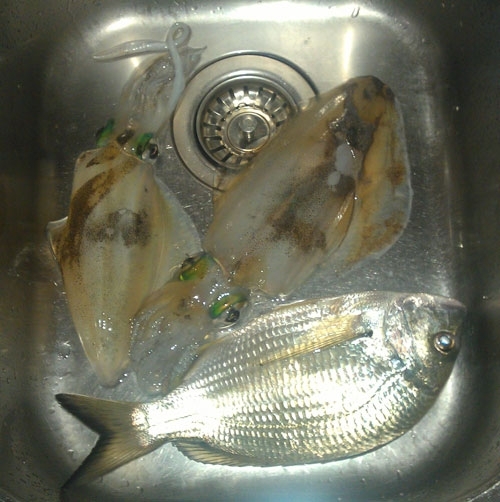 We also ended up with a keeper bream by dropping some small bait underneath us. A short fight ensued to prevent a dive behind the pylons. After last week’s success with the squid jig, we decided to concentrate on squid again this time around. We jigged for a long time for a total of 3 squid, one of them being a pretty decent southern calamari. Have to get them while they are around, they’re not as abundant as the arrow squid! So another warm Summer’s day and there was plenty of activity in the water. Most fish were undersized bream with the occasional bait fish. Swapped the rigs over for a squid jig and after a fair bit of time jigging we managed to get the two, one smaller one perfect for bait. The cold weather was really drying up the bait fish, meaning we didn’t really have any bait for the larger species. While trying to catch the baitfish, with small pieces of pilchard, we hooked on to something big! This was on 6 pound mainline and 8 pound trace. It was clearly a salmon after it took a few jumps as we were winding him in. It took about ten minutes but we finally brought it in, having to beach it. We also managed a small squid towards the end of the day.